I wish I could continue the story of how springtime is fastened to the sun and the moon. Instead, a storm of wind and frozen water has ruined all of my plans. I should expect this by now - I do live in a city of temperamental weather. Every morning I scan the sky, afraid of the wind that comes with it, hoping that by the end of the day I'll be wearing a skirt and smelling the harebells that grow in our neighborhood. Springtime I'll stop waiting for you. It is such a waste to constantly write about my length of love for spring flowers and warm weather when every year the same cycle continues. 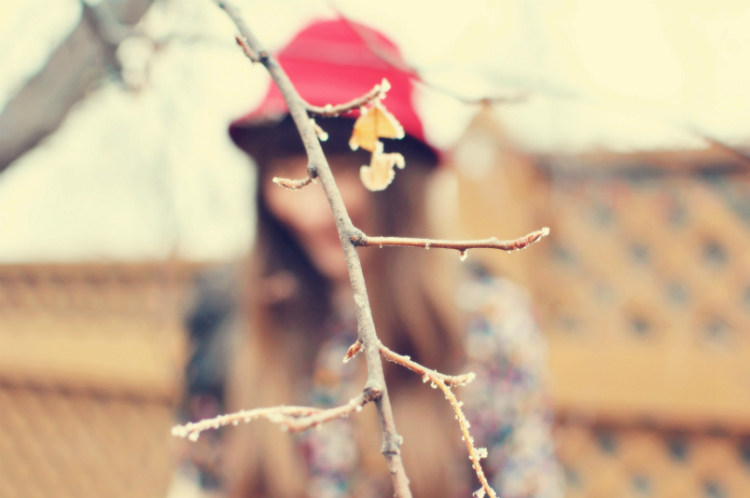 Winter always feels too long and prematurely dancing at the first sight of sunshine just ends in disappointment. I need to write and dream about things other than how the sky makes me feel. 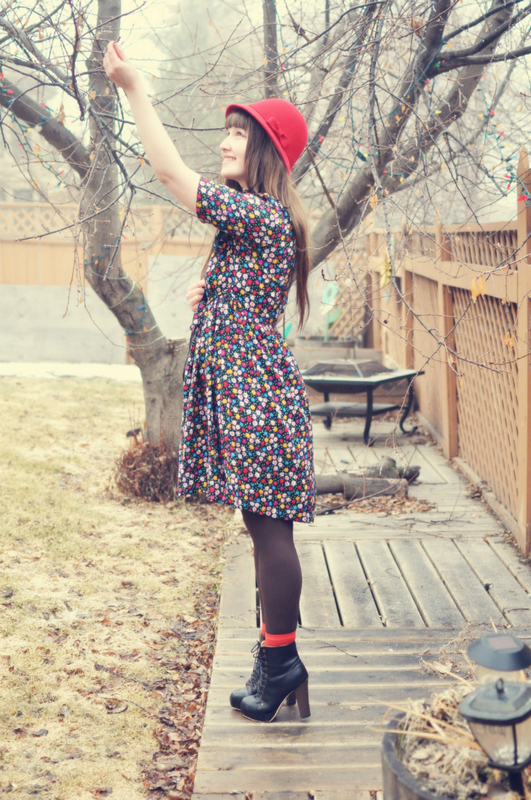 Wearing a dress made of flowers and socks, blooming red, is the medicine I need for having no flowers growing in the dirt outside. Autumn/Fall is my favorite season but it is probably because I am so used to the heat in Australia. It gets hard to live when your in a constant heat wave. I think spring is like an art gallery. Everything looks so beautiful and serene. Spring is like an art gallery isn't it --- What a beautiful way to describe the season I long for! 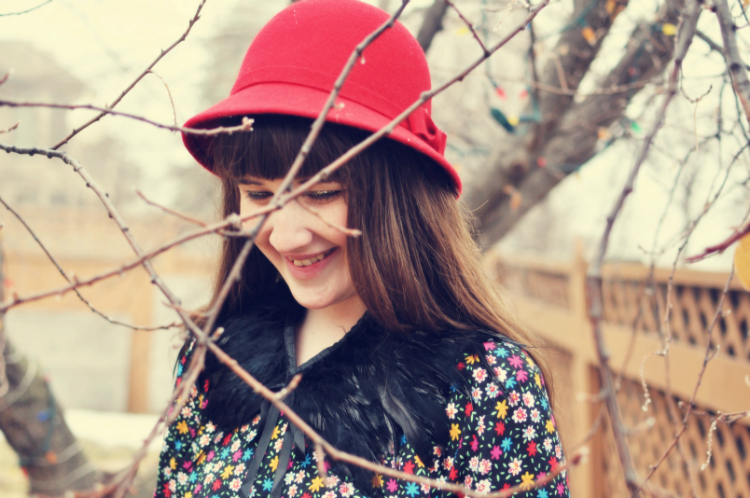 An adorable hat and I love your floral dress! Chic dress! I love the glittered eyeliner btw. Edge meets girl! I love it! Why are you always looking so cute?? Love this look!! Been looking for hat like that too for ages. Lovely as ever! 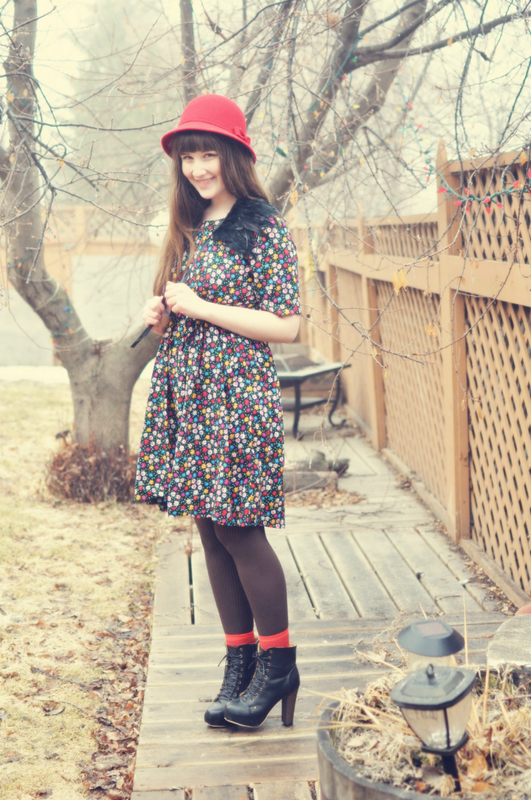 The bright floral hues, colorful cap and socks, and stunning feather collar give this outfit such delightful character. I always had a feeling you would like Pablo Neruda. He writes about love and you are the love of many ---- Keep inspiring us all. Well thank you Anonymous -- Pablo Neruda has inspired me every time I think of his words or read them. He was a true lover. Your comment was so generous! very cute outfit! I just saw one of your old comments on my blog and thought I'd pop by and say hi!! Your blog is fabulous! I hope we can talk more and become better friends! 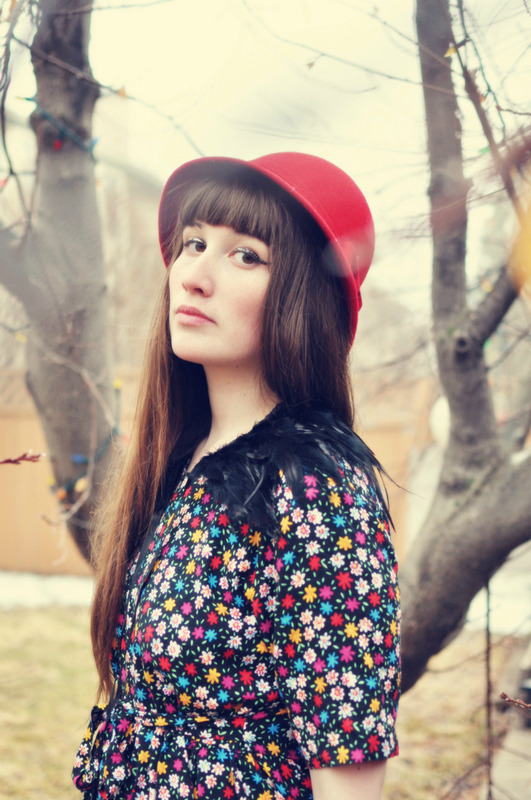 I love your cute cloche! XO! hi polly -- thank you for taking the time to comment. I'd love to be friends! sweet outfit! you got that hat at walmart? wow! Your sparkly eyeliner is so pretty! 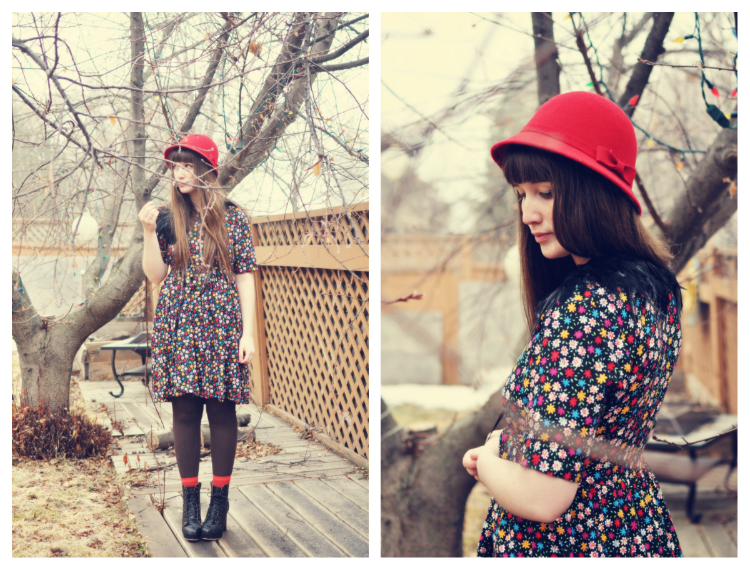 I'm loving your adorable floral dress paired with the red hat too. Adorable! 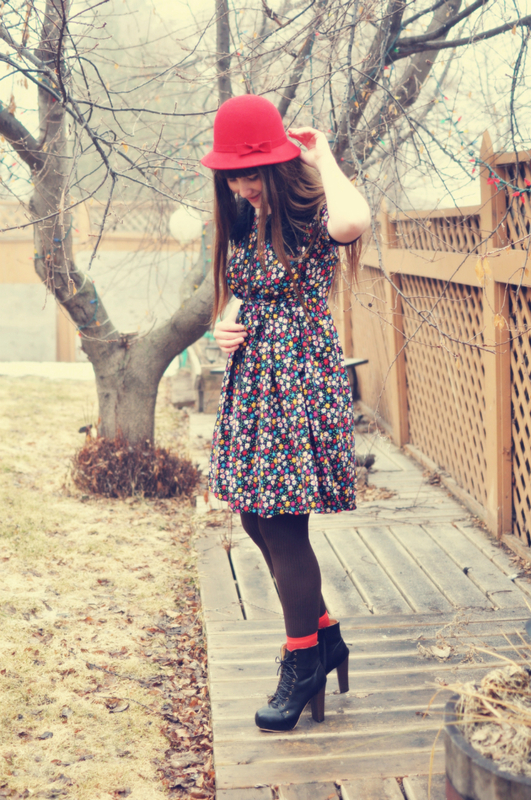 I love the red hat, and the flower print skirt is pretty. 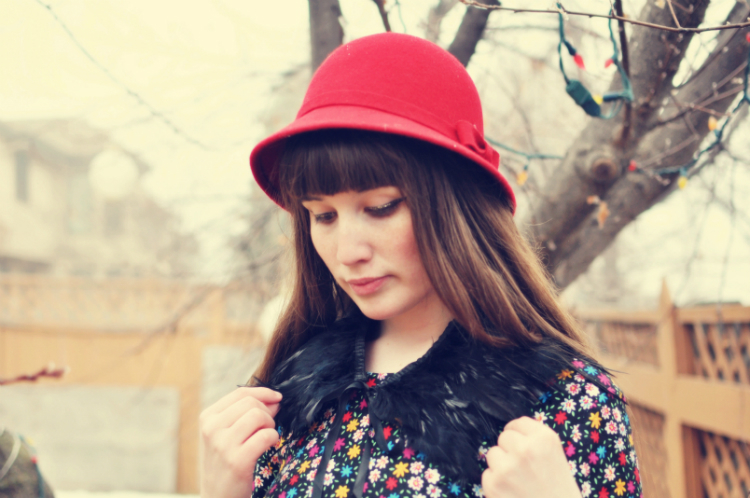 Great combination in this outfit, like your stunning red hat especially.